You've heard all about Long Island merlot, but what about the Malbec? Merlot might rule this over-grown sand bar, but Malbec, the large, easy-to-ripen black grape best known as Argentina's premier variety, is showing surprising potential in Long Island's maritime environment. 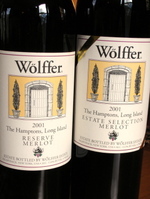 It has been grown, and used, on Long Island for quite some time—usually ending up as a minor component in Bordeaux-style red blends. But now, as Long Island vintners continue to experiment with grapes and techniques, varietal Malbec bottlings are becoming available. Macari Vineyards in Mattituck released its 2005 Malbec ($22) a couple months ago and it's impressive. It's a bold, flavorful wine and the ripeness of the 2005 vintage is apparent. It's loaded with intense black plum and black pepper aromas. The palate is rich and slightly meaty with more plum, pepper and a slightly juicy note on the mid-palate. The finish lingers nicely with a hint of spice. This wine signals the arrival of Malbec on the North Fork. It will be interesting to see how quickly local producers start doing even more exciting things with this grape. In the meantime, get a few bottles of this and try it will char-grilled steak this summer. Whole Foods Market Coming to Lake Grove? For a while now, it's been rumored that the SportsPlus is going out of business and that Whole Foods will take over the building. Well, an unnamed source that I have in the local commercial real estate business confirmed it yesterday. This is awesome news. I drive about an hour each way to their Jericho store now and this new one would only be 10-15 minutes...with traffic! I have calls and emails in to both Whole Foods and SportsPlus to further confirm the rumor. Hopefully I'll get a timeframe as well. Some of the wines that display Long Island's true nature--terroir if you will--are actually red blends, not the varietal merlots that are often lauded as the region's best. I know, shocking. I should be strung up for suggesting such a thing. Of course not all blends are created equal. There are more than enough wines that fall into the "meritage" catetory that seem more like a way to use up extra lots of lesser reds than anything else. 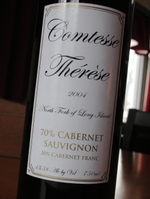 Theresa Dilworth, co-owner of and head winemaker for Comtesse Therese isn't making one of those. This blandly named but far-from-bland blend of cabernet sauvignon and cabernet franc named for its component grapes and their percentages: 70% Cabernet Sauvignon, 30% Cabernet Franc is plenty tasty and it captures "Long Islandness" well. This is a soft, slightly juicy blend that dodges the over-oaking that burdens some local blends and many wines from the slightly cool 2004 vintage. Very cabernet sauvignon aromas and flavors--blackberry, and black currant--are accented by subtle cinnamon, chocolate, smoke and violet notes. The tannins are soft and the noticeable acidity makes this a terrific food wine. This is the kind of wine I like this time of year, just as the weather warms. It's still a red wine, but it's not heavy or brooding. It reminds of me the transition between winter and spring. Even the most casual Long Island wine lover knows Castello di Borghese, located in Cutchogue. Their vineyards are where the Long Island wine industry got its start back in 1973—then known as Hargrave Vineyard after founders Alex and Louisa Hargrave. As such, a visit to Castello di Borghese offers visitors a chance to travel back to infancy of Long Island wine. That's this producer's past. That's the past and because winery's current owners, Marco and Ann Marie Borghese put the property back on the market for $9.2 million (it was purchased for $4 million in 1999). The entire estate is included — 85 acres (25 planted with vines), the winery, the tasting room, the warehouse and the beautiful family farmhouse. That's this producer's future. Castello di Borghese 2005 Chardonnay ($15) won a gold medal at the 2007 Florida State International Wine Competition, but that's not why it's good. It's just hard for me to trust some of these competitions. I prefer to taste wines myself and see what's what. But they got it right this time. This steel-fermented chardonnay is medium bodied with bushels of fresh apples and citrus on the nose and just a little brown spice—the result of aging in older oak barrels. On the palate, there are more apples—ripe and roasted—along with some slightly tropical flavors and vanilla spice. 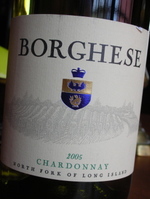 As I often find with Borghese wines, the balance is impressive with nice acidity that keeps the wine alive in your mouth. Rkatsiteli: A Future Finger Lakes Standout? Riesling is the king of the Finger Lakes, and most would agree that the Finger Lakes region consistently produces some of the best riesling in the United States. Similarly, riesling's Alsatian cousin gewürztraminer fares well in this region although its hard-to-pronounce name is sometimes a tricky sell with the casual consumer. So, how about rkatsiteli? Rkatiswhat? Rkatsiteli (pronounced R-kats-i-teli) is in fact one of the most planted varietals in the world and is grown throughout Eastern Europe. In Western Europe and the United States, however, Rkatsiteli is very rare. The grape is similar in style to Riesling and Gewurztraminer--crisp and acidic with a harmony of floral, citrus and spicy notes. Lenn recently gave rave reviews to Dr. Konstantin Frank's 2006 Rkatsiteli. Surprisingly, Dr. Frank's is the only Finger Lakes producer that grows rkatsiteli. I recently corresponded with Fred Frank, president and owner of Dr. Konstantin Frank's Vinifera Wine Cellars, about the future of rkatsiteli in the Finger Lakes. He told me that Dr. Frank's has been producing rkatsiteli in the Finger Lakes since the 1950s. Dr. Frank himself saw the grape one that was well-suited for a colder climate after encountering the grape during his studies in Eastern Europe. But, one of the reasons that rkatsiteli may not have taken off as an Eastern U.S. wine is that it is susceptible to fungus and is not as winter hardy as Riesling. In cooler vintages, it can be extremely difficult to tone down the acidity. Currently, Dr. Frank's has 10 acres of rkatsiteli planted and produces about 3000 cases each year. Fred Frank considers 2006 a great growing season for rkatsiteli, and this wine recently won a Gold Medal at the New World International Wine Competition and was also awarded Best in Class. Despite the fact that other Finger Lakes growers have not embraced rkatsiteli as of yet, there are other wineries in the Eastern U.S. that are growing it. 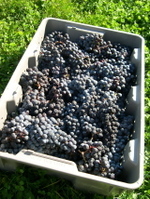 Horton Vineyards in Virginia, Tomasello Winery in New Jersey, and Wesport Rivers Vineyards & Winery in Massachusetts are all producing rkatsiteli. As the demand for Eastern U.S. wine grows, and consumers become less intimated by difficult names, perhaps other wineries will give this promising varietal a try. Heard Through the Grape Vine: LI Wineries Shutting Out Howard Goldberg? My post the other day caused at least a mini-stir in the local wine industry. Several people intimately involved in it emailed me privately about it rather than commenting on the site. So, I can't (and won't) mention any names or quote anyone directly--but Howard is definitely a man with a reputation on the East End. Some came out and said that Howard just plays favorites. Some joked that certain wineries must "have something" on him. Another said that it appears that Howard has favorites because he's ticked off so many out here that only a handful still send him samples. I have never met Mr. Goldberg so I can't speak from personal experience. This is just what I'm hearing and have heard. For whatever reason, there are a lot of wine lovers (snobs?) who turn their noses up at fruit wines. Maybe it's because I live in a state where quite a few are made, but I've found some great fruit wines--including this one. No, I'm not saying that this is some earth-shattering wine that will change your life, age for ten-plus years or anything like that. It's made with 20% Ida Red, 18% Golden Delicious, 18% Fuji, 17% Jona Gold, 10% Empire, 8.5% Gold Rush, 8.5% Breaburn apples, all grown by the Halseys of White Cap Farm in Bridgehampton. But, at just over 7% ABV, with clean, sweet apple flavor and gentle but playful acidity, it's seems like a great foil for cured meats, olives and cheese. And of course there are also the culinary uses in the kitchen--apple vinaigrette, pan sauces....yum. So, don't be a snob. Taste everything and anything once for yourself, including this one. For more info or to order, visit the Wolffer website. Who Wants to Make Some Wine in 2007? As you probably know, I made ten or so cases of cabernet franc in 2006. Bottling was delayed a couple weeks ago, but is should commence soon. Then, the wine will hopefully be ready just in time for Thanksgiving dinner. But that's the past. This post is about the future. For the 2007 vintage, I'd like to open it up to a few of you to join me in making some wine. Depending on who wants to join in and what they want to do, we may do another Chinon-style cab franc, but we could potentially do a merlot or a even a red blend. That's to be determined. The group would be involved in all facets of the winemaking project. We'll out and tend to the vines all summer, pick the grapes in the fall and, depending on the wine, do the blending etc. Obviously I can't have 15 people involved, but I don't see any reason why I can't have 5 or more people join me. If you're interested, shoot me an email ASAP so I can start getting the project rolling. Well folks, it looks like I'm not going to be able to drink a New York wine for WBW #33, hosted this time around by Doktor Weinolb. The theme is wines from the southern French region of Languedoc-Roussillon (which is often referred to as the Midi). It's not that simple though. Marcus wants to highlight the mid-priced wines of the region, so your wine of choice should be between $15 and $30 bucks. This is a region that I haven't explored much at all. But, I'll certainly enjoy seeing what I can find in local shops. Something tells me that I'm going to have to make a trip out to Stew Leonard's to find something of note. Howard Goldberg, who covers the Long Island wine scene for the New York Times is someone I've been reading for a long time. I have to, he has the job that I'd love to have some day. And on occasion, he still gets "scoops" that I miss out on. I guess the power of LENNDEVOURS still pales in comparison with the New York Times--for now that is. But, just because I read and respect him doesn't mean that I always have agree with him or his palate. In his column this week "You Say Roses, They Say Rosati" Howard writes about Channing Daughters Winery's latest three releases--three single-vineyard, varietal roses. That's all well and good. I have the same three wines in my tasting queue and hope to get to them this week. Where he and I disagree is on his assessment of their 2006 Mosaico ($29) a unique blended white wine. I tasted this one a few weeks ago and thought it was a well made blend and in a blind tasting I knew that it had to come Channing Daughters. Chris Tracy, their winemaker has a definite signature with his whites I think--balanced fruit with just enough acidity and some subtle brown spice. That's not to say that all of his whites are like that, but many of them are. And these are always nice wines though sometimes expensive. "...none of them matches the culinary artistry of Channing Daughters’ newest wine, Mosaico, one of the most sophisticated dry whites ever created on Long Island and one of New York State’s great 2006 wines. This thrilling and technically daring $29 blend consists of pinot grigio (34 percent), chardonnay (33 percent), sauvignon blanc (14 percent), tocai Friulano (7 percent), gewürztraminer (6 percent) and muscat ottonel (6 percent). It’s a ritzy fruit salad in a bottle." Now clearly he has every right to state his opinion, but it seems like there's more than a little hyperbole here. First of all, I'd argue that some of Tracy's past efforts are every bit as sophisticated. He makes a lot of great, interesting whites. As for "one of New York States' great 2006 wines"...isn't it a little early in the game to be throwing that around. We're not even five months into 2007 yet. There are an awful lot of 2006s still to come, no? Maybe he's right. Maybe not. I think it's way too early to say. And I'm not sure that "ritzy fruit salad in a bottle" is a description one would expect for a wine that is being talked about with such high praise. I think I make it pretty easy on my family when it comes to my birthday. I don't like huge parties (barely like birthday parties at all actually). A small affair with good friends and good wine is all I need to celebrate. And, when it comes to gifts, I think I'm even easier. Buy me a grill. Over the past few years I've gotten my new gas grill, a Weber Smokey Mountain Smoker and this year I went old school with a Weber kettle. 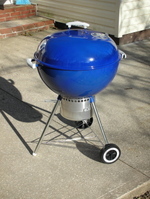 We also have an outdoor fireplace that can be used as a grill in a pinch. Now, you might think that this means I'm done with new grills...and Nena certainly thinks so (I have to give her credit for being tolerant of four fire-producers in our back yard). But I'm sure as time goes on I'll find something else I want. Oh...and no, it's not my birthday yet. But it's kind of hard to hide these big boxes. So, I get my gift when it arrives usually! I sit here Saturday morning a tired man, but a happy one. The project at my day job that has consumed me almost completely for so long has finally launched and while there is still a lot of post-mortem work to do, it feels good to look forward. I'm also a happy man today because I'll be spending a lot of time with Jackson both today and tomorrow. You see, his mommy has class all weekend, so I'm dipping my toes into the Mr. Mom pool. He's a good boy, so I'm sure it will go swimmingly. Lastly, I'm happy for the return to normalcy. I hope to be able to re-devote my evenings to all things vinocological, including this here blog. I'm very behind in writing up wines I've tasted, so you can expect a fair number of WTNs in coming weeks. I'm also planning a migration to Word Press that I hope will make LENNDEVOURS even better than it is today. If anyone has any tips for such a migration, please let me know. The calm after the storm is always a time and place that I enjoy. It gives us time to reflect on what we've accomplished, take inventory and also ponder the future. Hopefully we'll all enjoy that future together. I obviously taste--and write about--a lot of different New York wines. The vast majority come from Long Island, but there are a lot of wines from the Hudson River Valley and Finger Lakes regions that pass my lips too. But, western New York state has proven a tough nut to crack. For one, I can't get any of their wines locally. And two, few of them seem very press savvy. I've emailed all of them on numerous occasions asking for press kids and for a list of places where they sell their wine in the NYC metro area. Usually my emails go ignored. But one winery in Westfield, NY on the shores of Lake Erie--Vetter Vineyards on the Chautauqua Wine Trail--did get back to me. They even sent me some wines to taste. As a youth growing up in Western Pennsylvania, my family had a three-season cottage on Chautauqua Lake. And, with teachers for parents, we used to spend a lot of time there during the summer. But we never knew anything about any local wine industry. We were too busy enjoying the first-rate wings at a place called The Casino on Bemus Point. 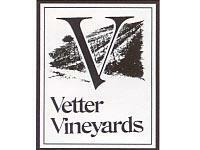 From the sounds of it, Vetter Vineyards hasn't always focused on quality over quantity. But, current owners Mark and Barbara Lancaster--who bought the wine estate from the Vetter family in 2003 are out to change that. Mark has over 20 years experience in the wine industry and he hopes to produce smaller batches of quality wine that can be made from the grapes they grow on their own land, including pinot noir, shiraz, merlot, pinot grigio, riesling, cabernet sauvignon and cabernet franc. The Lancasters want to make Vetter the region's premier boutique winery. Unfortunately, after tasting four of Lancaster's wines, I think they have a ways to go to accomplish that goal--at least by Long Island wine standards. My blind tasting started off well enough, with a simple-but-well made dry riesling. So pale that it is almost colorless, it's a clean, well-balance white. The nose is fairly aromatic with grapefruit, lime and other citrus mingling with just a little mineral character. Somewhat Alsatian in style, the wine has medium body and flavors that closely match the nose with a stony, minerally finish. After tasting this one, my hopes were sky high for the rest of the Vetter wines. Unfortunately, the chardonnay suffered from a complete lack of fruit. New, raw oak dominates the nose and while there is some nice creaminess and vanilla in the flavor profile, the oak just seems too heavy handed here, masking any fruit character that was there to begin with. Maybe chardonnay does better in this region when made without barrel fermentation and/or aging. Next was an extremely intriguing wine, a Traminette. Never heard of that grape? Don't worry, it's not that well known outside of central and western New York. 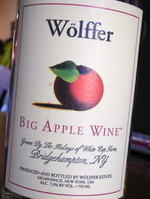 A hybrid grape created at Cornell University, it was made by crossing gewürztraminer with sevyal blanc. The result, at least in this bottle, seems tobe a wine that is strongly reminiscent of gewuerztraminer, but has some of the cold-hardiness of seyval. The nose is intense with flowers, lychee and pineapple. The palate, while a little sweet and lacking acidity, has bold flavors and a little spiciness. Overall, the balance is off here, but the potential seems to be there. Don't turn your nose up at this hybrid. The only Vetter red wine I was able to taste, a 2005 pinot noir, is barely drinkable. I wish I could say that the bottle was corked, but it definitely wasn't. Maybe it was just a bad bottle, but the flavors reminded me of a red delicious apple that you bit into and then leave on the counter--you know, the way it browns--and then bite it again. There's a little stewed black plum there too, but this is clearly not what I expected. I wish I had a second bottle to try, really. These wines aren't available in any local shops that I know of, but you can visit their website for more information. You may have noticed that LENNDEVOURS' contributing beer columnist, Donavan Hall, hasn't been writing much for us lately. Don't worry, he hasn't vanished from the face of the earth. He's just been busy. Like yours truly, he holds down a day job while exploring his passion for beverage writing in off hours. While I focus mainly on wine, the object of his desire is another fermented adult beverage--beer. This guy knows a lot about beer (I mean A LOT) and he even brews his own at home. From the sounds of it, he brews a lot of beer at home. Anyway, I'm happy to say that he's going to be bringing his local beer expertise back to LENNDEVOURS, but a little differently. Sure, he may still write a story here or there for us, but starting tomorrow, he'll be sharing his beer knowledge with us via a beer podcast. Come back tomorrow for more information. I know that I have a fair number of Albany-area readers, so I wanted to mention this upcoming wine dinner next Wednesday at 6:00 p.m. at 54 Park in Clifton Park. I've long been a fan of Pellegrini's wines and they are pouring some of their good stuff here, which is nice to see. They maket heir Finale ice-style wine with Gewurztraminer and Sauvignon Blanc grapes that were frozen in a commercial freezer. Not "true" ice wine in the traditional sense, but one of my favorites . It looks like Pete DeMeo will be representing Pellegrini at the meal. Pete is a great guy who knows his wine. Tell him I said hello if you go. Dinner costs $70 per person, plus tax and tip. 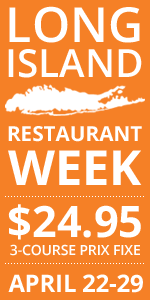 Reservations are required; call 518-688-1548. As many of you know, I spend my days working for one of the world's largest software companies as the content manager on our Internet marketing team. It's a job that I enjoy because I can do it from most anywhere, at most any time of day or night. That offers some level of flexibility which is great when one has a side career in food and wine writing. But, that flexibility hasn't existed for several weeks (if not longer) because we have a big project, that we've been working on for well over a year, that will come to fruition this Friday evening as we launch a new version of our website. That is why you haven't heard much from me over the last week or so, and likely won't hear much until post-launch. Roanoke Vineyards 2006 Chardonnay ($18). Really enjoying this as a casual sipper but it has a layer of complexity that the 05 didn't have. It really brings the best of barrel and steel fermentation together. Corey Creek 2006 Rose ($14). Simply put, I've had no better rose from the 2006 vintage. Fresh, crisp and flavorful. Paumanok Vineyards 2006 Semi-Dry Riesling ($22). One of the best Long Island...no, New York...rieslings that I've had recently.Has the right balance between residual sugar, acidity, fruit and minerality. Even some of that tension and electricity I love about German bottles. In case you missed it, I just wanted to point out that Gary V is tasting New York wines again, this time turning his tongue towards three rieslings from the Finger Lakes. And, as much as it pains me to admit it, he seems spot on with his impressions. I've not had the Silver Threat, but I have had both the Heron Hill and the Hermann Wiemer (which was part of the New York Cork Club's first shipment). Much like our Jet-fan "friend" I think the Heron Hill is just okay...but that Wiemer, oh that Wiemer, delicious. Check out Wine Library TV episode and laugh at Gary. I'm happy to announce that the LENNDEVOURS has just signed Jason Feulner as it's first Finger Lakes correspondent. 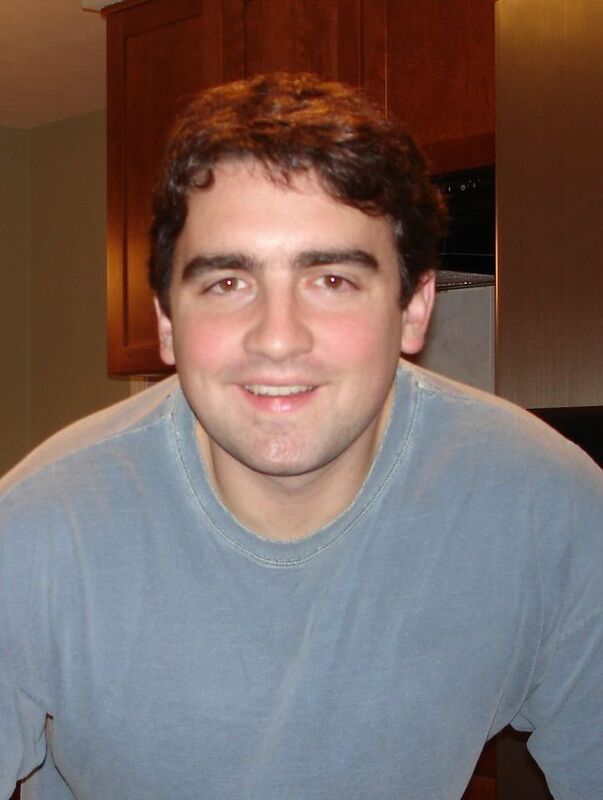 Jason is a long time LENNDEVOURS reader and is a resident of Syracuse who grew up in the Finger Lakes. His interests include economic development, cycling, hiking and--of course-- wine. Jason's expanding curiosity about Finger Lakes wine production has led him to explore the beautiful region and learn quite a bit about its emergence in the wider world of wine. While he won't be reviewing any wines specifically, he'll be covering the region in ways only someone local to the region can--with news, insights and trends as his focus. A love of history will no doubt spill over into his writing as well. Join me in welcoming Jason to the fold. On the North Fork, there is an un-official red wine grape pecking order. Okay, maybe it isn't even un-official. 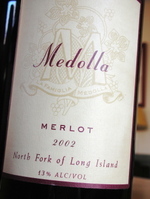 At the top is the almighty merlot grape, lauded by many observers as the king of Long Island grapes. And, it has earned such a reputation with good reason. It seems ideally suited to the regions climate and soil conditions--and consistently leads to many of the region’s best wines. Next in line is cabernet franc, genetic parent to cabernet sauvignon and known mostly for its popularity in the Loire region of France and as a blending grape in Bordeaux. It ripens early compared to its offspring and results in several different styles of red wine--from un-oaked, Chinon-style bottlings to richer, sometimes heavily oaked renditions that almost seem Cabernet Sauvignon-like in their style and profile. Last but far from least--to me anyway--is cabernet sauvignon. The king of California reds doesn't hold the throne here because it doesn't always ripen fully, leading to significant vintage-to-vintage variation. In a wet or cool year, Long Island cab can taste very green and have harsh, astringent tannins. A lot of the time it's used for rose or just blended into other things in down years. But in the good years...wow. 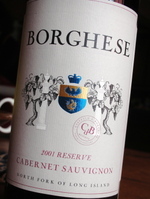 2001 was one such year and Castello di Borghese’s 2001 Cabernet Sauvignon ($35) is a terrific example of this wine's potential on the North Fork. With elegant, refined red cherry and earthy aromas, this is East Coast cab at its finest and a wine that many California winemakers and wine lovers might not even recognize. The palate is beautifully balanced with ripe, well-integrated tannins, red cherry, sweet cedar and crushed fall leaves and just a hint of spice. Today is the second Wednesday of the month, and lately that means it's Wine Blogging Wednesday. This month's edition--the events 32nd--is hosted by The Wine Cask Blog, which has asked participants to compare two wines from the same winery and same vintage, but one a 'regular' bottling and the other a 'reserve.' Definitely a fun concept and one I looked forward to. Rather than just do one comparison, I decided to do two pairs--one white, one red, one from the Finger Lakes, one from Long Island. Starting with the whites, I tasted and compared two 2005 chardonnays from Treleaven Wines (made by King Ferry Winery). The regular bottling retails for $13 and is definitely made in an every day style. The nose is pretty tight but has some floral and lemony aromas with a little vanilla in the background. It's fresh and pretty lively in the mouth with nicely balanced citrus flavors with just a little oak character and some minerals on the finish. All in all, it's a nice wine for the money. Definitely a wine worth drinking. For an extra four bucks, you can upgrade to the reserve bottling. Here, the flavors are similar but a bit richer, fuller and less austere. The vanilla and oak is more obvious on the nose with a little spice joining the floral and citrus aromas. 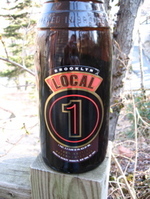 The body is slightly fuller as well, with softer (but still balanced) mouthfeel and a juicy peach note towards the end. In this case, for only an extra four bucks, I'd buy the reserve most of the time. But, both are good. Moving to the red wines, let me first say that this was going to be a three-tier tasting, but I couldn't find a bottle of Wolffer Estate's 2001 La Ferme Martin merlot, their entry-level merlot. So, with the theme in mind, I was left with two, but they are from one of Long Island's best vintages, 2001. The reserve merlot ($17) offers red berries and lots of cherry with tobacco, vanilla and a little green herb on the nose. The palate is medium bodied and elegant with fine tannins, red berries, vanilla and a tobacco note towards the end. There was a time when this was our house red because it's extremely food friend and versatile. It's flavorful but not overpowering. Made with grapes from their oldest merlot vines and with more new oak, the estate selection merlot is $35 and clearly a much more flavorful and ripe. Darker in the glass and more aromatic, the nose offers darker fruit, with plum and blackberry joining the cherry flavors along with some smoky cedar. The palate is slightly fuller boddied with firmer--though still ripe--tannins. Ripe, full blackberry and plum flavors are there from start to finish with a much fuller, flavorful mid-palate and a much longer finish that ends with a vaguely minty note. This is a much tougher choice, given the price difference, but I'm still thinking it's worth upgrading to the higher-level wine. At $35, it's not for every day but it's very much worth the splurge. 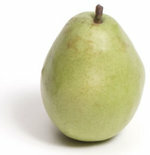 So I have a bottle of eau de vie de poire (pear brandy) from Warwick Valley Winery in the Hudson Valley, and I have very few ideas of how I can or should use it. I've tasted it, of course, both chilled and at room temperature (much better chilled) and I suppose I could serve it--ice cold--as a digestif at the end of a meal, but there's got to be some culinary uses. In my early travels as a wine writer (outside of this blog that is) I've come across more than a few editors who aren't interested in my wine reviews. "You don't have any formal wine training, Lenn." I've always found that to be a bullsh*t reason. Just because I haven't spent thousands of dollars on formal training, that doesn't mean that I don't smell what I smell and taste what I taste. I've always says that the best way to learn about wine is tasting it--no matter where. Eric Asimov of the New York Times and The Pour, seems to agree given his story today. He thinks that tasting wine at home is a great way to learn wine, particularly for beginners, and outlines a simple way to explore the wine world. I can't agree more. That doesn't mean, however, that I don't see value in formal education. When I have the time and money, I plan to pursue some myself. But it's not the be all end all. Remember that. In the story, Eric has two different wine shops put together $250 cases of wine that represent the the wine world. With that in mind, keep an eye out right here on LENNDEVOURS for the Ultimate New York Case. 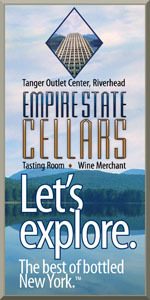 I'll be combing through my tasting notebooks and my memory banks to put together a case of New York wines that shows of the state's unique regions and terroir.